There’s nothing better for us than trying out a new game and then getting a rush of excitement when you realise just how much you love it. Unfortunately that memory is already a couple of years old for us when it comes to Baccarat but with any luck it’s about to be the feeling you get when you discover live Baccarat for yourself! Live Baccarat isn’t a game that appears at every casino up and down the country which means there will be a good few of you that have missed out on this exciting game although not for much longer now we’re sure! Live Baccarat is a little different to the other table games at a casino as it isn’t strictly a case of you versus the dealer. 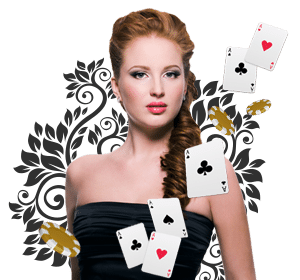 In fact there are three different betting options in this game which are bet on the dealer, bet on the player, or bet on a draw so there is a bit of added variety here you won’t find elsewhere. Just like Blackjack live Baccarat is a points game where the party with the highest amount of points at the end of the game wins. The cards in Baccarat are worth the same as in Blackjack (Ace is 1/11, face card is 10, and number is its value) except how you work out your final score is a little different. When you add up all your cards at the end of the game you only take the final digit of that number as your end score. So if you were dealt a 6 and a Queen your total points would be 16 but your final score would be 6! This means the highest score in Baccarat is 9 and that’s what you’ll be hoping the person you bet makes. Now the reason you can bet on the dealer in this game is that live Baccarat essentially plays itself out and you don’t need to make any decisions that can affect the outcome. This should make the game even more enticing to new players but we’d also say it doesn’t take anything away from the game either. The game begins with both the player and dealer being dealt two face up cards and then their current score(not points) are tallied up. If anyone has an 8 or a 9 at this point of the game it comes to an end with the highest score winning, or a tie if you have the same. If not the player will be dealt a final card and depending on what it was + what the dealer currently has will determine whether they also take a card. If that sounds a little complicated then you don’t have to worry as each live Baccarat table has a chart letting everyone know when a card is to be taken by the dealer. Once this round is over the game comes to and end with the highest score winning the game. Playing live Baccarat is incredibly simple to do and when you load up your desired table you only need to click on a chip you’d like to bet with and then click on either the dealer, draw, or player section to declare what you’re betting on. When the game is played out by the live dealer and you win the hand your account balance will be topped up with the winnings right away while the next hand is set up. Hopefully we’ve given you the confidence to try out live Baccarat for yourself and better yet we hope you get that same feeling we did when we first started playing it all those years ago!